Today I was linked to this fantastic HD video on YouTube of Tokyo in 1992. It's so clear! I really dig urban history, so I snapped a few screenshots of my favourite moments. 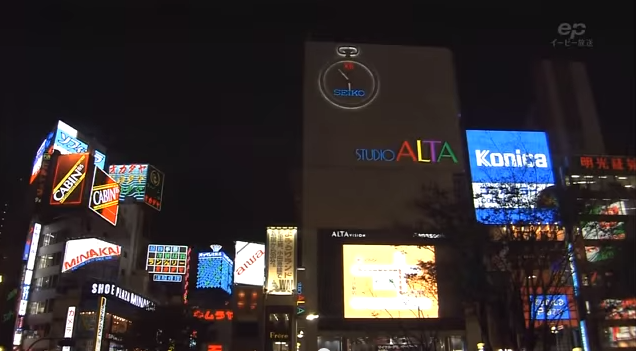 The video includes this nice shot of Shinjuku's Studio ALTA, a look at the Rainbow Bridge during construction (! ), and a Shibuya scramble crossing that's so unrecognizable that I didn't even realize right away that I was looking at the entrance to Center Gai. Wow. Check out the video, and for extra credit, have a look at this blog post about Studio ALTA, featuring a photo of the lower half of the building, in 1989!